Alfonso Aguilar, the executive director of the Latino Partnership for Conservative Principles, discusses immigration policy reform at a CNN en Español event Wednesday. CNN en Español hosted a documentary screening and a panel discussion focused on immigration policy at the Jack Morton Auditorium Wednesday. The documentary, “Voices of Immigration,” told the stories of migrants affected by President Donald Trump’s immigration policies, including families who were separated and immigrants who were already living in the United States both legally and illegally. After the screening ended, four panelists discussed various facets of immigration policy, like the effects of legislation, divisive rhetoric and how immigration impacts the economy and the country. 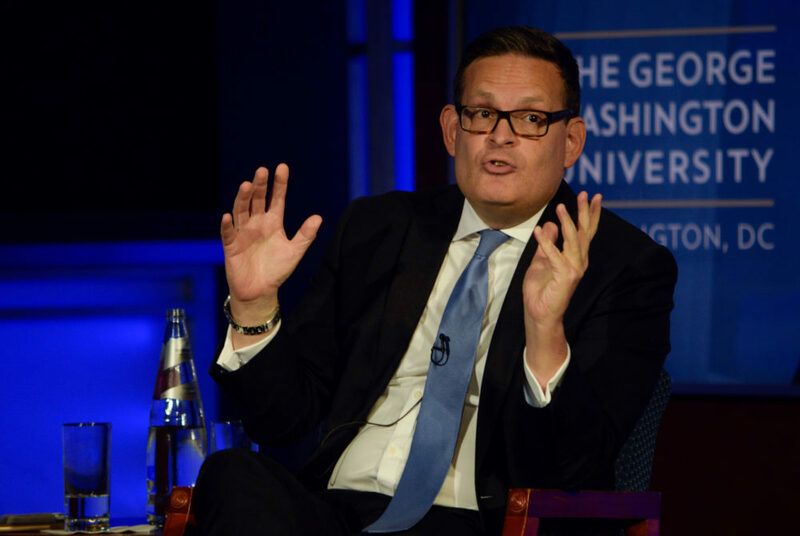 Juan Carlos López, an anchor and chief correspondent for CNN en Español in the District, moderated the discussion, kicking it off by asking about Trump’s immigration policy and its impacts on immigrants and the country as a whole. Eileen Blessinger, an attorney who represents immigrants separated at the border, discussed the effects of Trump’s “zero-tolerance” policy, which calls for the prosecution of all undocumented entrants into the United States. She said all of her clients who sought asylum were denied and, in many cases, there was never a hearing. “I have never seen a period of so much fear in my community,” she said. The panelists discussed the effect that undocumented immigrants have on the country and economy. Alfonso Aguilar, the executive director of the Latino Partnership for Conservative Principles, said undocumented immigrants do the jobs Americans will not do and help create jobs for citizens. Aguilar added that migrant workers will continue to cross the border illegally if Congress does not pass immigration reform legislation. Aguilar agreed with other panelists that both Democrats and Republicans are responsible for the divisive rhetoric that surrounds immigration. He called for bipartisan cooperation on the issue. The panelists said there is a long way to go before lawmakers can create an amicable solution to the issues immigration poses. Roberto Izurieta, the director of Latin American projects for the Graduate School of Political Management, said the results of the midterm elections in November will affect his hopes about resolving this complex issue. He said the divisive political rhetoric used about immigration issues on the campaign trail distracts the public from what should bring people together – a shared desire to aid the less fortunate.